Science Day is “Open House” at the University of Stuttgart. Here is your chance to get to know the University better and experience hands-on science. Once a year, the University of Stuttgart opens the doors to its laboratories. Exhibits, lectures, experiments you can touch and help perform: this is how we bring research and teaching to life. We demonstrate exciting research topics and provide information on study programs as well as occupational training and continuing education at the University. On Science Day, the University of Stuttgart also shows its youngest guests how exciting science can be. The pupil campus entertains with a multitude of hands-on offerings for kids and youths. The University of Stuttgart invites you to a discovery-filled day for a behind-the-scenes look at the world of science. Come and experience engineering, natural sciences, humanities, and social sciences in an exciting, understandable, and up-close way! Attention, big and little futurologists! 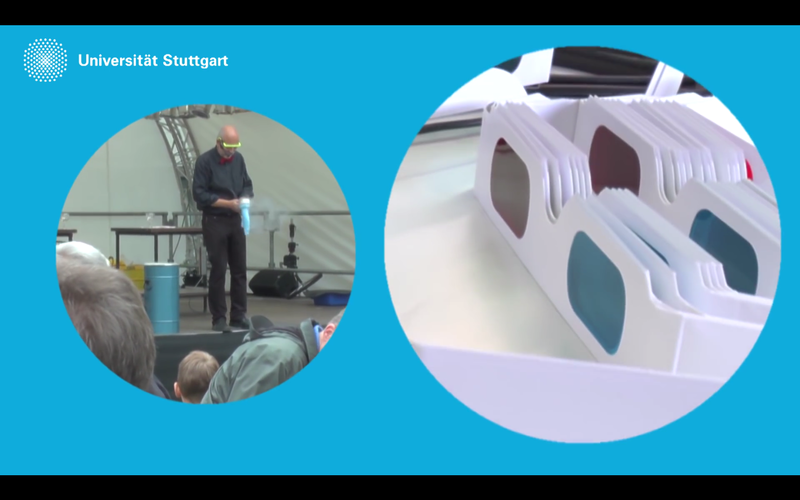 The University of Stuttgart invites you to Science Day – for guaranteed excitement, fun, and wow! experiences. The “Pupil Campus program for children and youth” offers lots to explore. You can watch, listen, and do experiments yourself. The University of Stuttgart puts on informational events about its degree programs to help pupils make the decision to study and to choose a subject. Staff members from the University Student Counseling office will be right there to provide information and counseling about study programs options, applying and admissions. If you are looking for occupational training, the University of Stuttgart is also the place to be. Metal, wood, electric, biology or chemistry? Laboratory, office, or shop floor? The Training Center on Science Day will lay out for you the many dual traineeships available. Members and invited guests of the alumni network "alumnius“, of the Alumni Club, of the University booster clubs and guests of the Rectorate meet in the UNI Pavilion. Make new contacts over a cup of coffee and meet former fellow students – interesting conversations and encounters await you in the UNI Pavilion.